Britain\'s Andy Murray reacts during a news conference after his men\'s semi-final match defeat to Switzerland\'s Roger Federer at the 2015 Wimbledon Championships in Wimbledon, southwest London on Friday. Andy Murray admits it will be hard to recover from Roger Federer's Wimbledon semi-final masterclass in time for Davis Cup duty next week. Murray's bid to reach a third Wimbledon final was shattered by Federer as the Swiss star produced one of his greatest Centre Court displays to win 7-5, 7-5, 6-4 on Friday. It was a painful setback for Murray, who did little wrong against Federer but was powerless to halt the imperious seven-time champion. 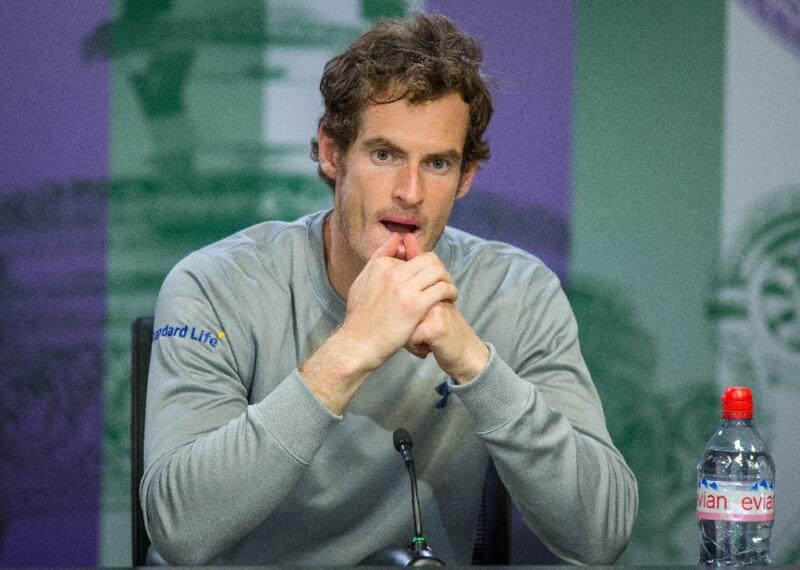 Murray, who won Wimbledon in 2013, conceded it would take him days to get over his last four exit. But the 28-year-old has little time to lick his wounds because he is due to link up with the Great Britain squad for their Davis Cup quarter-final against France, which starts next Friday at London's Queen's Club. "The match itself won't be hard. It's more making sure I do the right stuff over the next week because the next few days are tough," Murray said. "When I've lost in Slams in the past, it's always the same a few days afterwards. I do find it hard. "I'm always pumped to play the Davis Cup. But obviously I need to rest and then prepare properly for the tie. "That's the thing that I need to try and get right, which maybe for the next few days won't be so easy." Rather than berate himself for failing to find a solution for Federer's majestic display, Murray was willing to admit his opponent-his serve especially-had simply been too good. "He served fantastic, apart from the first game where I had the chance there. I didn't really have any opportunities. Then that puts pressure on you as the set goes on," Murray said. "I don't know if he's close to his peak. You'll have to ask him. But that's definitely the best he served against me. "To be honest, he clearly deserved to win the match. He had more opportunities than me." After having the misfortune of running into Federer at the 17-time Grand Slam winner's absolute best, Murray was asked where the 33-year-old ranked in the pantheon of sporting greats. The world number three was quick to salute Federer's talent and his longevity, but he also suggested women's world number one Serena Williams, who has 20 major titles, deserved equal billing. "I don't know if anyone's played as well as Roger maybe at that age," Murray said. "Serena obviously on the women's side is doing it. They're pretty rare athletes, two of the best that have ever played the game. "People can talk about someone like (Barcelona striker Lionel) Messi, people love the way he plays the game. He makes it look easy. "Roger's a great sportsman, a great tennis player. It's tough to say if he's the best of all time. Serena's got a fair shout at it as well right now." Murray can still take heart from a strong 2015 that has seen him reach the Australian Open final, win his first clay court titles and make the last four at the French Open and Wimbledon. "I feel like this is my best chance to win a slam. I've played consistently well here throughout my career. So it's tough in that aspect," Murray said.